Composer and pianist Martin Amlin has received grants from the National Endowment for the Arts, the Tanglewood Music Center, the Massachusetts Cultural Council, the Massachusetts Artists Foundation, the St. Botolph Club Foundation, and the Massachusetts Council for the Arts. He was a recipient of an ASCAP Grant to Young Composers and has received many ASCAPlus Awards. He has been a resident at Yaddo, the Virginia Center for the Creative Arts, and the MacDowell Colony, where he was named a Norlin Fellow. Much of his music is characterized by a pungent tonality and energetic rhythms. Sonata for Piccolo and Piano and Sonata No. 2 for Flute and Piano have each won the National Flute Association’s Newly Published Music Competition. Concerto for Piccolo and Orchestra was premiered by the Atlanta Symphony Orchestra, and he has had performances of his music by the Pro Arte Chamber Orchestra, the Tanglewood Festival Chorus, the John Oliver Chorale, the Back Bay Chorale, the Webster Trio, and the American Vocal Arts Quintet. He has had commissions from the Seattle Flute Society, Pacific Serenades, the Chicago Flute Club, ALEA III, the James Pappoutsakis memorial flute competition, pianist Andrew Willis, and clarinetist Michael Webster. Martin Amlin is Chairman of the Department of Composition and Theory at Boston University and Director of the Young Artists Composition Program at the Boston University Tanglewood Institute. He is also recipient of Boston University’s Kahn Award for his Piano Sonata No. 7. He studied with Nadia Boulanger at the Ecoles d’Art Américaines in Fontainebleau and the Ecole Normale de Musique in Paris, and received masters and doctoral degrees as well as the Performer’s Certificate from the Eastman School of Music. Mr. Amlin has appeared as soloist with the Boston Pops Orchestra in performances of Mendelssohn’s Piano Concerto No. 1 and Gershwin’s Rhapsody in Blue, and has performed on the Boston Symphony Orchestra’s Prelude concerts at both Symphony Hall and Tanglewood. He has also appeared on the FleetBoston Celebrity Series and has been pianist for the M.I.T. Experimental Music Studio and the New England Ragtime Ensemble. He has often been heard live on Boston’s WGBH radio station as both performer and composer, and has given the world premiere of many new pieces. Martin Amlin has recordings on the Albany, Ashmont Music, Centaur, Crystal, Folkways, Hyperion, Koch International, Opus One, Titanic, and Wergo labels. 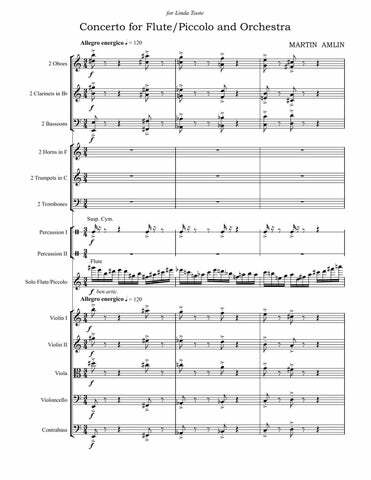 Arranged for Wind Quintet and String Quintet(arr.) 14:00 fl., ob., cl., hn., bsn., 2 vn., va., vc., cb. Arrangement for Mixed Chorus, 2 Horns and Harp(arr.) 18:00 SATB Chorus; 2 Hn. Hp. 9:00 Solo Fl.(dbl. Picc. ); 0 2 2 2 – 2 2 2 0; 2Perc. Str. 20:00 Solo Picc. ; 2 2 2 2 – 2 2 2 0; 2Perc. Str. 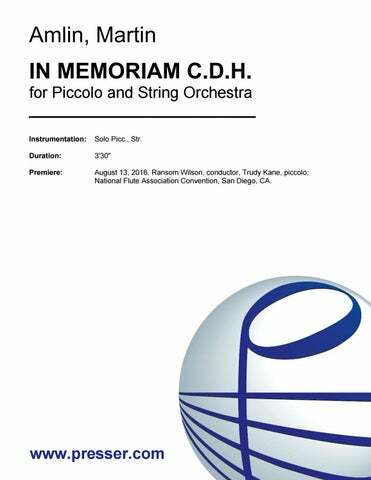 for Piccolo and String Orchestra 3:30 Solo Picc., Str. for Baritone and String Orchestra 7:00 Solo Bass-Bar. ; Str. He delights in tripping up one’s metrical expectations through unexpected irregularity of meter or sudden syncopated accents… harmonically rich in a basically tonal idiom… If this is conservatism, it doesn’t really advertise itself as such… his freely rhapsodic treatment of his material, and the hidden mechanisms (including elements of dodecaphony, not rigidly adhered to) speaks of the eclectism of our times. …He likes technical achievements and games–fugues; inversions; retrogrades; rhythmic complexities and quirks; 12-tone rows that don’t sound like tone rows; hidden references to Bach, Beethoven, and “Happy Birthday”; variations that lack a theme, so all of them in a set are in effect variations on one another. He likes to bend the rules…Some of these games are part of the fun…Amlin uses them to create powerful coloristic and emotional effects. All the music –brisk and reflective–is purposeful and effective, and idiomatic both for the hand and for the instrument. The highlight of the convention for piccoloists was the world premiere of Martin Amlin’s Concerto for Piccolo and Orchestra…Divided into five movements, the concerto’s brilliant orchestration creates excitement without ever over-balancing the piccolo. …a sparkling work…the harmonies employed are rich and varied, captivating the ear. All three instruments are given a real workout, but this music must be as fun to play as it is to listen to. The texture, tempo, rhythm, and atonal nature of this piece is advanced and exciting. 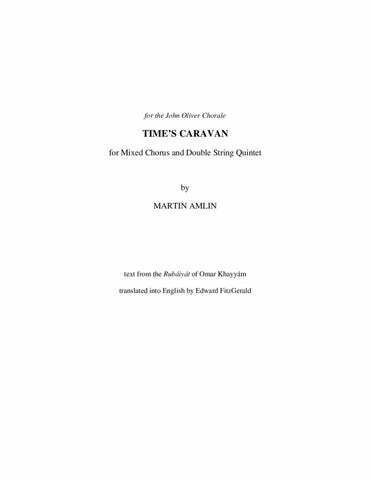 …a truly first rate work, a significant addition to the clarinet literature. …it sets the tone of brightness, accessibility, and rhythmic drive that is characteristic of the entire compact disc. The harmonic language is fairly ’conservative modern,’ and contrapuntal dialogue is common. …an engaging work with a strong rhythmic profile and a lyrical impulse, in which the flute and piano lines are marvelously integrated. 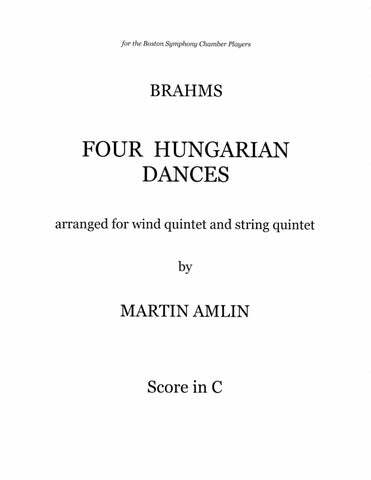 Martin Amlin’s delicate harmonic shadings linger in the mind long after the recording finishes. This work is a stunning showcase for both [piccolo and piano]. Through its five movements the work explores the piccolo range with lyrical expressiveness and wild agility, and the conversation between piccolo and piano is exquisite. Amlin has found an appropriately luscious style that is at once assured and unstable, unstable enough to depict the uncertainties of life the verses are concerned with, and flexible enough to respond immediately and imaginatively to the wide-ranging imagery of the text…The Chorale obviously loves singing it; so will every other suitably equipped chorus in the land – this piece is destined for long popularity. …an astonishing mix of neoclassical and neoromantic elements.